I remember when I was a grassroots coach in New York City, I would travel from city to city with our high school teams in hopes of helping our guys land Div. 1 scholarships. I would get excited when we would compete during the “live periods” in front of college coaches. It would motivate me to see guys that I played with and against in high school and college who were now in coaching — coaches who recruited me as a player and childhood friends like Shaheen Holloway of Seton Hall and Van Macon from Saint Louis moving up the college coaching ranks. Coaching AAU basketball afforded me the luxury of coaching — and coaching against — top-notch talent from across the country at every age/grade level imaginable. I had developed tons of contacts and relationships that I knew could pay dividends on the recruiting trail for any university I worked for. I thought to myself, how hard can this be? All I needed was an opportunity and this would be easy. So when Norm Roberts called me in the summer of 2008 and offered me a spot on his staff at St. John’s University as a video coordinator, I finally had my chance. I was off to the races! Little did I know what I was in for. My first year at St. John’s was a wake-up call. I remember every day saying to myself, “I had no idea all of this came with the job.” Recruiting, scouting, film sessions, film exchange, individual workouts, team practices, scheduling, unofficial visits, official visits, academic requirements, academic progress reports, mail outs, phone logs, class checks, summer camps, elite camps and the list went on and on. I learned a lot about college basketball that year from Chris Casey (Niagara University), Fred Quartlebaum (Kansas University) and Glenn Braica (St. Francis-NY). In that one year I realized there was a lot more responsibilities to the job of an assistant coach than I anticipated. I quickly realized I wasn’t ready to become an assistant coach at that level as I once thought was so easy. My dream of becoming a Div. 1 assistant was put on hold Friday, March 23, 2009. I got a call from one of my closest friends, Tarik Turner, telling me that my wife Sharette Dixon had a sudden heart attack and was at a local Brooklyn hospital in critical condition. We later found out she had walking pneumonia and didn’t know it. We had three small children at the time. My oldest son Kamaal was 6, my middle son Khaliq was a week away from his 5th birthday and my daughter Salimah was 2, about to turn 3. Sharette passed away two days later. To say that my world was turned upside down and my hands were full would be an understatement. With the help of my family and friends, over the next few years we were able to get our feet under us. In the Spring of 2011, I felt like I was ready to get back into college coaching as a full-time assistant. That way, I figured, I could continue the natural progression in my career as a coach and earn a living that would allow me to take care of my family. I knew I was ready. I had the wealth of knowledge I gained as an administrative assistant at St. John’s. I had matured as a person and as a coach as a result of a tragic situation and I was motivated by my family to climb the coaching ladder. Luckily for me, there were several coaching changes in the New York City Metropolitan Area that spring. Seton Hall, St. John’s, Fordham, Rutgers, Hofstra, Manhattan, Fairfield, Iona, St. Francis, Princeton and Monmouth all had coaching changes that spring. That meant there were multiple opportunities for me to become an assistant coach close to home where I could utilize all my connections and relationships to be the best assistant coach I could be. That should have been a layup right? WRONG! I interviewed at Manhattan College, Fordham University and Hofstra University. I want to thank Steve Masiello, Tom Pecora and Mo Cassara for bringing me in for an interview that spring and giving me the opportunity to go through the process. It definitely helped prepare me for what was ahead of me. Needless to say, I didn’t land any of those jobs. I was discouraged, disappointed and left questioning myself. Would I ever get another opportunity to get back into college coaching? After that, I did what I always did when my back was against the wall — I FOUGHT LIKE HELL! I worked every camp I could find, I watched college practices, I developed more relationships in coaching. I wanted to let everybody know that I was disappointed that I wasn’t hired by any of the area schools but I wasn’t bitter and I wasn’t going to allow that to deter me from someday reaching my ultimate goal. Fast forward: I’ll never forget when I was driving in my car in New York and I got a call from Rob Lanier and he’s telling me that Richard Pitino just got the FIU job and he thinks he wants to hire me. First thing I ask him is “Where is FIU?” He tells me, it’s in Miami. Well, sign me up! Over the next few weeks, another good friend Mick Cronin and Lanier worked for me and I was able to secure an interview with Richard down at FIU and, ultimately, I landed the job. I was excited and relieved at the same time. All the hard work had paid off. I had reached my goal of becoming a Div. 1 assistant coach and I was ready to start right away. I’ve been with Richard five years now and it’s been an awesome experience working for him. I’m positive that every trial, tribulation, triumph and defeat leading up to me landing that job at FIU truly helped prepare me for that opportunity and I was confident and ready for it when it came. If I wasn’t a committed AAU coach in New York City, I would’ve never earned an opportunity to become an administrative assistant at St. John’s. If I didn’t value and cultivate relationships with numerous coaches in college basketball without expecting some benefit from it, I would’ve never earned the opportunity to become an assistant coach at FIU. If I didn’t prove to Coach Richard Pitino while at FIU that I was a good person, I would work hard and be loyal to him, I would’ve never earned the opportunity to become an assistant coach at Minnesota. My point is BE WHERE YOU ARE! Prepare for the job you want but not at the cost of being the best at the job you have. We all want to climb the ladder of success but we can’t cheat the process, we have to trust the process. If you’re an AAU coach right now, run the best AAU program in the country. Put the kids and families first and you will get everything you deserve. I’m living proof! If you’re a Graduate Assistant right now, be the best GA in the country. Check those classes like nobody’s business. If you’re a video coordinator, be the best video coordinator in the country. Have those scouts tight. If you’re a low-mid major assistant, be the best low-mid major assistant coach in the country. Get you some guys who shouldn’t be at your level and coach them up. If you’re a high-major assistant where the stakes are as high as they can be in our profession, be a soldier for your boss, be a defensive lineman for him and always let him know you have his back. At the end of the day, opportunities in our business are few and far in between, so if you have a job, that’s because you earned it and someone gave it to you. So appreciate it and BE THERE NOW! Kimani Young followed a stellar playing career at UTEP under legendary Coach Don Haskins with experience on the grassroots level. He served as Program Director of AIM High Foundation, Assistant Center Director with PAL of NY and Athletic Director of New Heights Inc. before joining Norm Roberts staff at St Johns 2008. 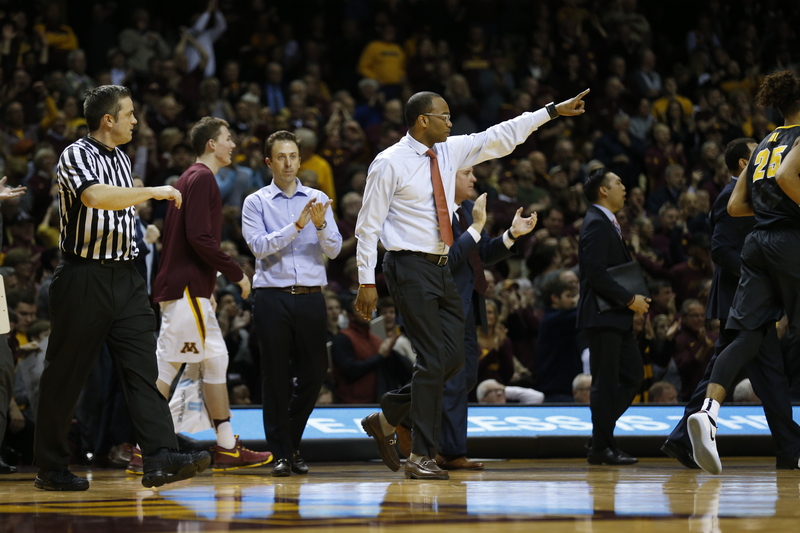 Coach Young joined Richard Pitino’s staff at Florida International University in 2012. He followed Coach Pitino to Minnesota and was an integral part of the Golden Gopher staff from 2013-18. Coach Young is currently a member of Dan Hurley’s staff at the University of Connecticut. Excellent article, Coach. Continued success at Minnesota and beyond. Good advice, Kimani! Congratulations & Good Luck in your chosen profession! Great read. You put everything crystal clear. So many coaches in this business on the grassroots level should read this article. It would be very beneficial. I always think sometimes things should have been different between us. The man upstairs has a plan & path for all of us. Keep up the great work my dude. You are a testament to what consistent focused hard work can help you achieve in this business for any aspiring coach on that level. Well thought out delivery and I am sure it is heartfelt. I know from whence he comes and am extremely proud of him and the perseverance he has exemplified. However, I am most proud of the father he has become. I expect him to continue to excel. Finally, I will be there to assist him whenever he calls. Thanks for sharing Kimani! Best wishes as you move forward with your life and career. WOW! Kimani I remember you as that skinny kid always dribbling the rock and now you have become a Man. It warms my heart to see you persevering and flourishing and I’m proud to say that I knew from before all of that. Peace and blessings Bone…hopefully you still get that reference lol. I wish you nothing but the best and know we all from Lefrak are rooting for you big time! I’ve watched you grow up since you was about 11yrs old…Im proud of the man you have become!